The average cost of memory care in Waukesha County is $5,812 per month. This is higher than the national median of $4,650. Cheaper nearby regions include Jefferson County with an average starting cost of $4,137. To help you with your search, browse the 25 reviews below for memory care facilities in Waukesha County. On average, consumers rate memory care in Waukesha County 3.9 out of 5 stars. Better rated regions include Washington County with an average rating of 4.0 out of 5 stars. Caring.com has helped 14 families in Waukesha County find high-quality senior care. To speak with one of our Family Advisors about memory care options and costs in Waukesha County, call (855) 863-8283. Promotion ends in 5 days! Promotion ends in 254 days! Waukesha County is a large county with more than 400,000 residents, including a senior community that makes up about 18 percent of the population. It's projected that nearly 9 percent of seniors in this county who rely on Medicare benefits are living with Alzheimer's disease or dementia. This dementia-capable county provides services and supports to those with dementia and is home to numerous businesses and organizations that have received training to be dementia-friendly. Additionally, the county has 22 memory care facilities, most of which are located in community-based residential facilities. These facilities are licensed and regulated by the Wisconsin Department of Health Services. The American Lung Association reports that ozone pollution levels in Waukesha County are moderate, giving the county a C for this type of pollution. Particle pollution levels are very low, with the county receiving an A for 24-hour particle and a passing grade for annual particle pollution. The overall cost of living in Waukesha County is about 20 percent higher than state and national averages, and healthcare expenses are slightly higher here than elsewhere in the state and country. This may be a consideration for families and seniors who are looking for affordable memory care options. Waukesha County receives about 34 inches of rain and 42 inches of snow annually, versus the national medians of 39 inches of rain and 26 inches of snow. Year-round temperatures range between 13 degrees and 82 degrees, and residents enjoy 190 sunny days annually. Waukesha County's relatively cool climate may be good for seniors who are sensitive to heat. In Wisconsin, seniors do not pay state income tax on government pension income or Social Security benefits, even that which is subject to federal income tax. Private pension income and withdrawals from retirement savings accounts are fully taxable. 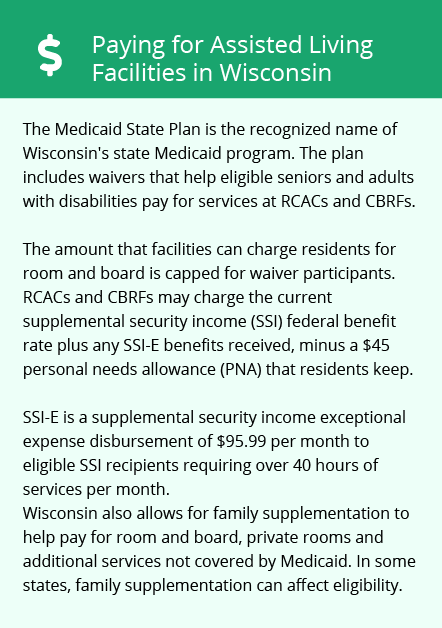 This may affect how much can be budgeted toward memory care expenses in Waukesha County. Memory Care costs in Waukesha County start around $5,812 per month on average, while the nationwide average cost of memory care is $4,800 per month. It’s important to note that memory care rates in Waukesha County and the surrounding suburbs can vary widely based on factors such as location, the level of care needed, apartment size and the types of amenities offered at each community. Learn more about these programs, plus who’s eligible, on our Memory Care in Wisconsin page. For more information about different ways to finance memory care, visit our Memory Care in Wisconsin page. Waukesha County and the surrounding area are home to numerous government agencies and non-profit organizations offering help for seniors searching for or currently residing in an assisted living community. These organizations can also provide assistance in a number of other eldercare services such as geriatric care management, elder law advice, estate planning, finding home care and health and wellness programs. To see a list of free memory care resources in Waukesha County, please visit our Assisted Living in Wisconsin page. 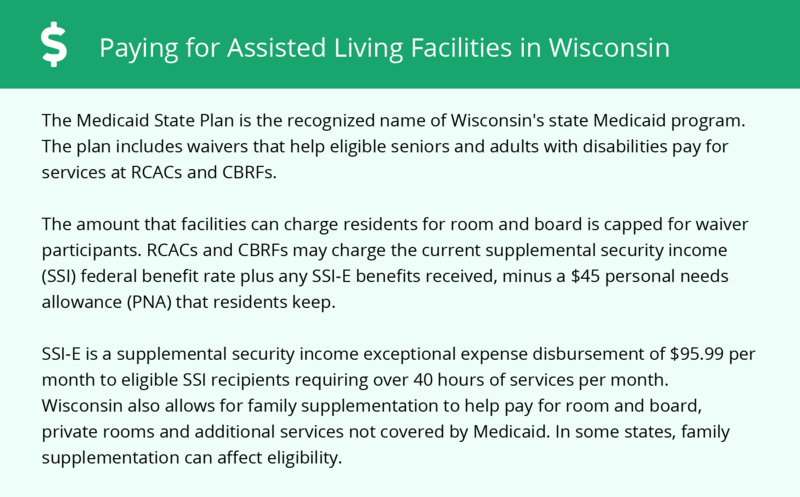 Waukesha County-area assisted living communities must adhere to the comprehensive set of state laws and regulations that all assisted living communities in Wisconsin are required to follow. Visit our Memory Care in Wisconsin page for more information about these laws.